Besides Building Strength and Muscle...What are they good for? The Unusual Applications of Isometrics never cease to amaze me. Just when I think I understand every application of Isometrics, something else comes along and stuns me. Obviously, nothing works faster or is as effective in building muscle strength, tendon strength, ligament strength etc and nothing touches isometrics in terms of building volume and density of muscle mass. If that's your primary focus you can learn more here. However, Isometrics is far more than simply a method of developing strength and muscle. Yesterday I was in the studio of movie magic legend Tom McInerney. Tom is the genius behind the makeup and special effects of major TV shows such as The Tudors, Merlin and currently Vikings. I've known Tom for years and have worked with him on a few projects. Several years ago I sat for a full head cast - in a very unusual position my head was tilted to the left hand side and positioned forward. This head cast would later be fully transformed into a broken necked body, bullet hole ridden and eaten by fish....and this headcast would later be featured on the cover of Film Ireland magazine...and that's pretty cool. What's interesting about this that I had to remain completely frozen in an 'uncomfortable' position for an extended period of time. To achieve that position I had to make a series of gradual incremental muscle contractions till the team were happy with the position. Then I had to 'lock' that position and hold it for 40 minutes while the liquid rubber was applied to my face, allowed to dry before a hard plaster cast was moulded un top. The pull was apparently particularly good in comparison with the other headcasts because I didn't move a muscle. I was able to maintain this perfectly frozen state using isometrics. Yesterday...I had the pleasure of sitting for Tom again...this time for new Batman Cowl. (I am Batman after all). On this occasion, it was just Tom and myself, no team. As such I had to hold a specific, forward tilted, elongated posture, with my mouth completely covered and my nostrils 80% covered. And this time I held the posture for a solid 1 hr and 40 minutes. 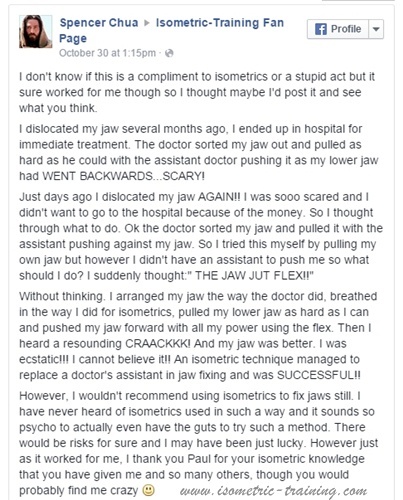 During this time I maintained a slight jaw jutt flex (taught in Perfect Body), a right hand side scapular pulldown, and free spinal isolation. During this time I was in a cold, mostly unheated warehouse in the height of Irish Winter. I used a series of sub 60% hand and forearm contractions (some taught in Perfect Body, some from my upcoming Samurai Strength Program to warm my hands and keep from going numb. All without upsetting the delicate contractile balance in the neck, back and shoulders. To do this requires a particular type of skill in muscle control and of course a high level of isometric strength and endurance. And here's another very odd application of Isometrics - I DO NOT RECOMMEND THIS - but it's too good an example of The Unusual Applications of Isometrics to leave out. 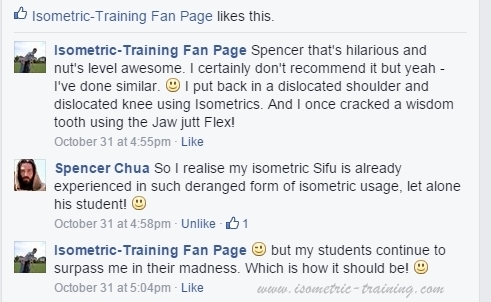 This is from our Isometric-Training page and comes courtesy of long time isometrics enthusiast Spencer Chua. How crazy is that? :-) It just goes to show though how far reaching the Unusual Applications of Isometrics are. You've been reading about The Unusual Applications of Isometrics. Check out the instructional video for a full isometric contraction right now.